"A Place of Our Own". Totes 45-rpm records safely . type record holding post on the inside. record lover . . even comes gift-boxed. speaker. 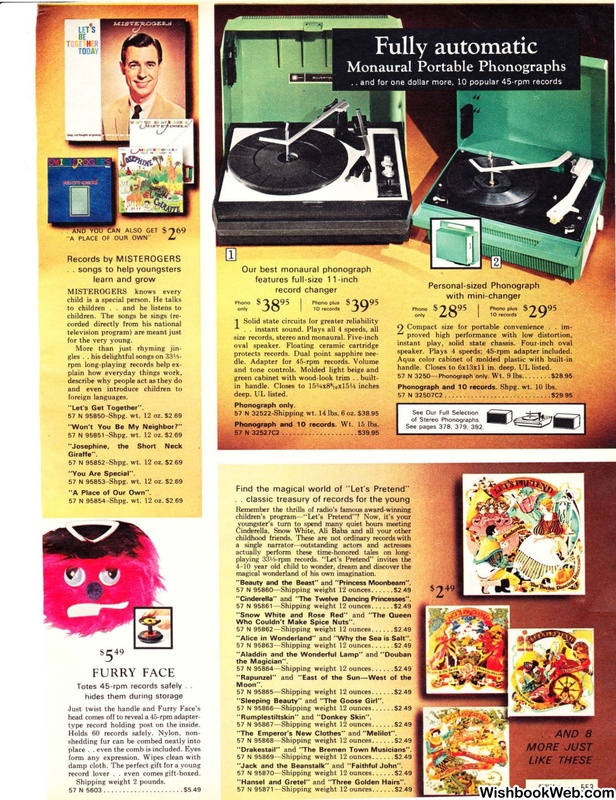 Plays 4 speeds; 45-rpm adapter included. handle. Closes to 6xl3xll in. deep. UL listed. Phonograph and 10 records. Shpg. wt. 10 lbs. 10 records. Wt. 15 lbs. Find the magical world of "Let's Pretend"
magical wonderland of his own imagination.
" Beauty and the Beast" and " Princess Moonbeam".
" Cinderella" and "The Twelve Dancing Princesses". Who Couldn't Make Spice Nuts". "Alice in Wonderland" and "Why the Sea is Salt".
" Sleeping Beauty" and "The Goose Girl" . "Rumplestiltskin" and " Donkey Skin". "The Emperor's New Clothes" and " Melilot".
" Drakestail'' and "The Bremen Town Musicians". "Jack and the Beanstalk" and "Faithful John".
" Hansel and Gretel" and "Three Golden Hairs" .